I love risotto. And, I love vegan risotto. It’s such a simple, humble dish that all home cooks should know how to master without a recipe. Risotto is a northern Italian rice dish cooked with broth until it reaches a creamy consistency. Risotto is most often made from arborio rice, a short-grain rice variety that has the ability to absorb large amounts of liquid while still maintaining some bite. Often risotto is made with butter and cheese, which can add flavor, but I don’t find it necessary to produce a velvety texture. Arborio rice contains high starch levels which makes for a perfectly creamy vegan risotto without any dairy. The key to getting a rich flavor is a low and slow cooking technique and lots of aromatics, salt and healthy fat. The best creamy vegan risotto recipe. 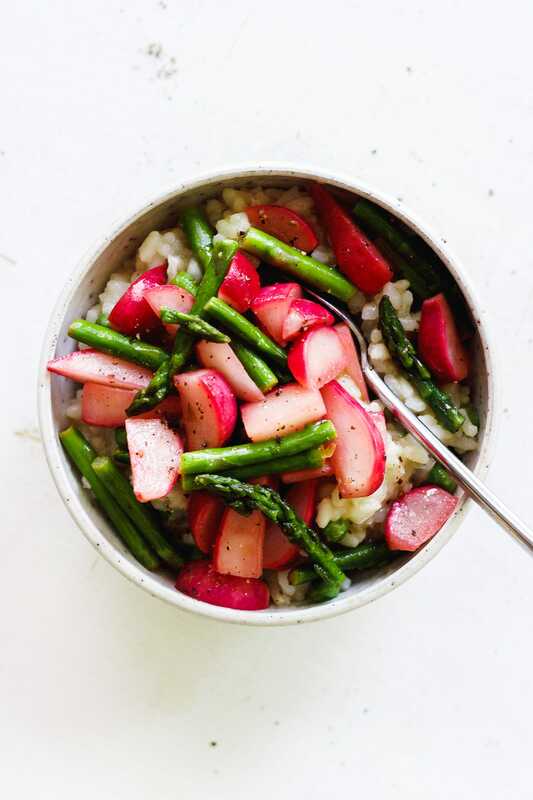 This basic risotto recipe starts with a base of white onion, garlic, sea salt and olive oil. Then the rice joins the party and gets toasted slightly. Then I slowly, and little by little add in an organic, low-sodium vegetable broth. You can use any broth you have on hand, but I find a good quality (or homemade) vegetable broth is the way to go. This way you can control the amount and type of salt you want in the dish. Additionally, the doneness of risotto is somewhat of a preference. Some prefer a thicker texture while other prefer a looser texture. And I like something somewhere in-between the two. Using less or more broth is something you can play around with to find the texture you like. There’s really not a wrong way to do risotto. 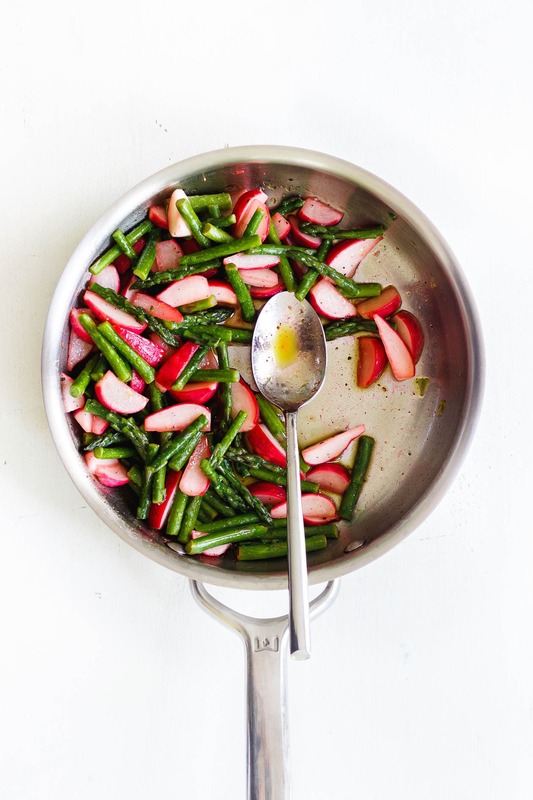 Lastly, I sautéed some asparagus and radishes in a generous amount of olive oil, lemon and pepper. 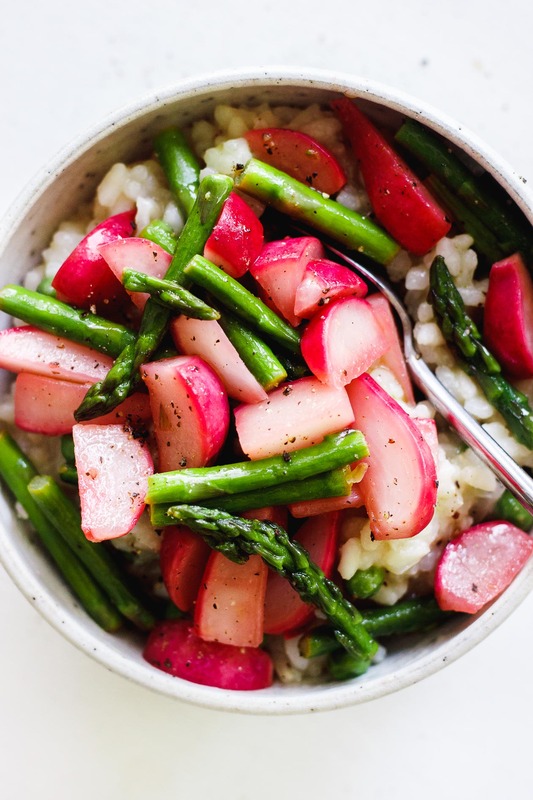 Asparagus and radishes are some of the first fresh vegetables popping up in spring. And they complement each other really well. Radishes are wonderful cooked. Have you tried cooked radishes before? But the best part about this vegan risotto is that it can be topped with whatever seasonal ingredients you have on hand. Zucchini, peppers, eggplant and basil would be great in the summer. And sweet potatoes, kale and sage would be amazing in the fall and winter. For a grain-free vegan risotto option try this cauliflower risotto recipe. Add the broth to a sauce pan over low heat. Cover with a lid until you're ready to use it. Heat 3 tablespoons olive oil over low heat in a large sauté pan. Add the onions and sweat for about 5 five minutes. Then add in the garlic and sweat for 1 minute more. Next add in the rice, stir to combine it with the oil, onions and garlic and toast for 1 minute. Then add in 1 l cup of the warm broth and bring to a gentle simmer, stirring frequently while allowing the liquid to fully absorb. For the next 30 minutes continue this process of adding in the broth, 1 cup at a time, bringing it to a gentle simmer, stirring frequently and allowing the the liquid to absorb. The risotto is done when it is soft but still al dente in the middle. You may use all 4 cups of broth, or more or less (see notes). When the risotto is done cooking taste and season with salt if desired. Add in the peas, stir and cook for 2 minutes. Remove the risotto from the heat and set the pan aside. Meanwhile heat the remaining 3 tablespoons olive oil in a sauté pan over low heat. Turn the heat up to medium and sauté the radishes until they are bright pink. Then add in the asparagus, lemon juice and pepper. Sauté for 5 minutes or until the asparagus is tender. Taste and season with salt. 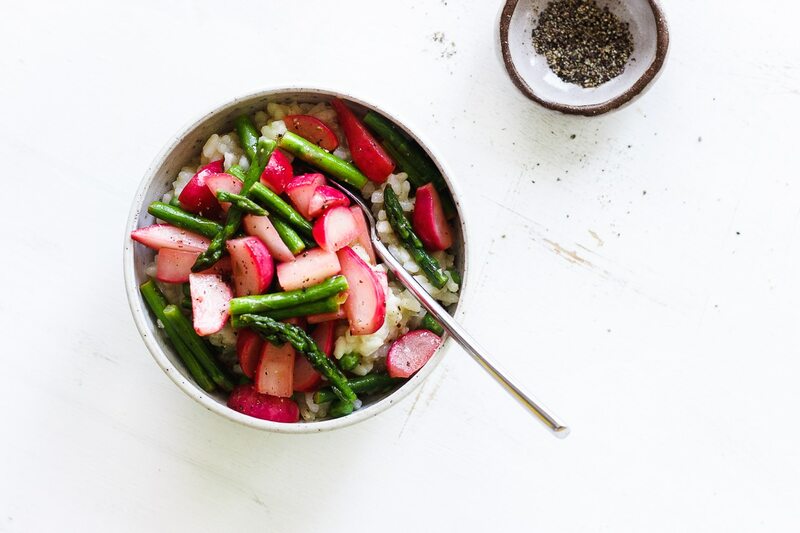 Portion the risotto into bowls and top with the spring vegetables. Add more black pepper and a squeeze of lemon if desired. You can add in more or less broth (it may be more than 4 cups) until you've reached your desired consistency. More vegan risotto recipes you will love. This recipe is just so perfect. 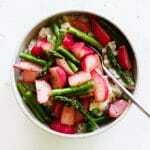 Both asparagus and radish are veggies that I love. Can’t wait to make it for my family. Gorgeous photos as always.